I read this article and found it very interesting, thought it might be something for you. The article is called Why It Is Hard To Double Farmers’ Income By 2022 and is located at https://archive.indiaspend.com/cover-story/why-it-is-hard-to-double-farmers-income-by-2022-2022. Paddy procurement center in Raipur, Chhattisgarh, India. 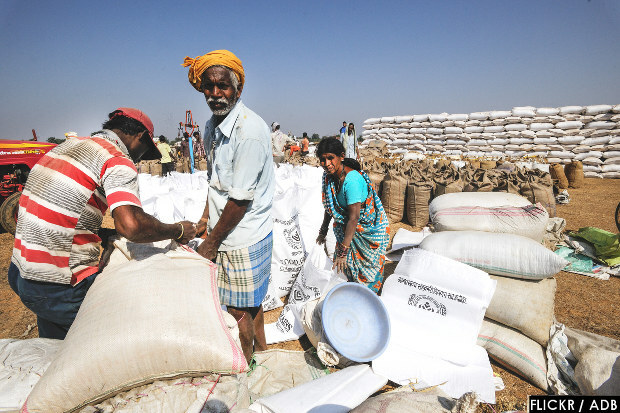 “We are grateful to our farmers for being the backbone of the country’s food security. We need to think beyond food security and give back to our farmers a sense of income security. Government will, therefore, reorient its interventions in the farm and non-farm sectors to double the income of the farmers by 2022.” —Finance Minister Arun Jaitley, budget speech, February 29, 2016. After adjusting for rising costs, an Indian farmer’s income effectively rose 5% per year over a decade (2003-2013), according to an IndiaSpend analysis of various government data, calling into question Jaitley’s declaration of doubling income over the next five years. Doubling of real incomes would be “a miracle of miracles”, as it would imply a compound growth rate of 12% per annum, Ashok Gulati, former chairman of Commission for Agricultural Costs and Prices and Professor, Indian Council for Research on International Economic Relations, wrote in Indian Express. The average monthly income from raising crops and rearing animals increased from Rs 1,060 in 2003 to Rs 3,844 in 2013, according to the report Situational Assessment of Agricultural Households by the National Sample Survey Organisation, a compounded annual income growth rate of 13.7%. The 2003 report considered only land-owning farmers, while the 2013 report considered all agricultural households, including landless labourers, we will consider only incomes from cultivation and rearing animals. To double the income of farmers by 2022, in nominal (numerical) terms—which do not take inflation into account—would require a 15% annual income growth rate (compounded), according to our estimates. So, the government would seemingly have to ensure a marginal increase in the rate of income growth—keeping business as usual—from 13.7 % to 15% per year to deliver on the promise of doubling farmer income. * the fact that 85% of farmers do not benefit from insurance. Unless these issues are addressed, a farmer’s income will only double nominally. Real income in 2022, adjusted for inflation and increased expenditure, will still be close to 2016 income, according to this report by Devinder Sharma, an eminent food and trade policy analyst. Profit margins of farmers are declining because of dropping farm productivity and a rise in input costs. While income from cultivation in 2013 became 3.6 times that in 2003, input costs tripled in the same period, almost nullifying the effect of tripling income. Does it help any longer that government buys harvests? Started in 1965, the Minimum Support Price (MSP) is a system of artificial pricing that attempts to ensure just remuneration to farmers. The Commission for Agricultural Costs and Prices (CACP) fixes the MSP of procurement for 23 agricultural items produced in India. There is very low awareness about MSP — less than 25% of farmers on an average, while for some crops, less than 5% — know about MSP. Over the last three years, the MSP for all crops increased from up to 12% per year, compared with up to 42% in 2012-13, up to 53% in 2011-12, and up to 39% in 2010-11. MSP increases can fuel inflation—and, so, higher monthly expenses—in urban areas. The MSP for ragi (finger millet) was hiked 52% in 2008-09, for tur dal (pigeon pea) 52% in 2010-11, for rapeseed/mustard 35% in 2011-12, and for jowar 53% in 2012-13. Efficient agricultural markets can also be a potent tool for poverty reduction, noted this 2012 Reserve Bank of India report. Farmers do not get remunerative prices due to the limited reach of MSP—less than 25% farmers know about MSP—and an agricultural marketing system that delivers only a small fraction (10 to 30% of the retail price, according to this Business Standard report) of the price to the farmer, said this NITI Aayog report. Regulatory barriers have constrained investments in agriculture markets and lowered capacity of farmers to be domestically and internationally competitive. Multiplicity of taxes under Agriculture Produce and Marketing Committee laws in various states have undermined interests of farmers and benefitted middlemen, said the NITI Aayog report. Only 19 million — or 15% — Indian farmers benefitted from crop insurance schemes announced by the government in 2014-15. As many as 37.2 million farmers were covered under the three schemes—National Agricultural Insurance Scheme, Modified National Agricultural Insurance Scheme and Weather Based Crop Insurance Scheme — but only half of them benefitted from it. Note: NAIS – National Agricultural Insurance Scheme; MNAIS: Modified NAIS; WBCIS – Weather Based Crop Insurance Scheme. Half of those who did not use insurance were unaware of crop insurance, the NSS report said. Pradhan Mantri Fasal Bima Yojana (Prime Minister’s Crop Insurance Scheme), the latest government initiative, merges existing insurance schemes, reduces the premium to be paid by farmers and removes the limit on government subsidy to insurance. “China started off reforms with agriculture in 1978, and during 1978-84, agriculture GDP (gross domestic product) increased by more than 7% per year and farm incomes by more than 14% per year due to deregulation of prices, halving poverty in just six years,” Ashok Gulati wrote in this research paper. With agricultural GDP in India growing 1% in 2015-16 (advance estimate), it will not be easy to increase individual farm incomes 14% per year. One problem with the concept of ‘farmers’ is that in most analyses farmers are treated as a monolith; all are equal and all are the same and all are hugely distressed. so, unless there is dis-aggregated data the term farmers in economic reckoning becomes pretty meaningless. Which Haryana or Punjab leader has not shouted from rooftops that he is not a farmer? All the bigger land owners around expanding cities (and there are many), have sold their land for a bomb and are millionaires for at least the next couple of generations. Lakhs of ‘farmers’ in these states have relatives and children in the US or Canada. And now many of these fellows get reservation in government jobs in Haryana. To say that these ‘farmers’ are now so very distressed is blatantly hiding or ignoring facts about their incomes and assets for political reasons. Are there any rich, upper and middle class farmers in these states? if so, how many? How is it that many ‘farmers’ do not know about MSP and if they did would the rodent population of India explode (if it hasn’t already)? It is becoming increasingly hard to believe in states like Haryana and Punjab poverty and want is stalking villages! Doubling the budget is the first step. A farmer thrives on water. hence using the budget to make meticulous plans for water conservation and transportation til the farms is the key. Sadly, the data on http://164.100.47.190/loksabhaquestions/annex/7/AU810.pdf link does not have a .csv or .xlsx file. But I have a couple of questions. 1. Did you get the 37.2 million farmers number from the same sheet? 3. I’d very much like to know how “coverage” happens. For instance, many states show zero coverage during some Rabi seasons. So obviously there is some intelligence and knowledge at play here. The fact that 75% of farmers don’t know about MSP should indicate that at least a comparable percentage would not be very aware of crop insurance. Unless the pricing by middlemen is regulated strictly, income of farmers will not rise.